Choosing the best mouthwash isn’t always as easy as just grabbing the cheapest bottle at your local drugstore. 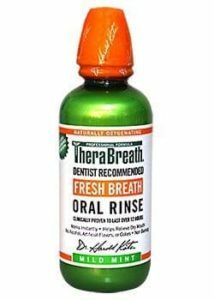 These days there are oral rinse products to combat not only serious bad breath, but also stop cavities, help with dry mouth and even whiten your teeth. Whatever your needs, we have rounded up the best rated and best-selling mouthwashes that can help improve the overall cleanliness of your teeth and help keep gum inflammation at bay. Listerine has been around for over 100 years, and it is a reasonably divisive product. You either love the burning sensation you get when you use it, or you hate it. The burning is, of course, caused by the alcohol that is one of the main ingredients. 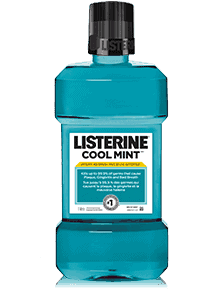 A lot of consumers have been looking for alternatives to the alcohol-based mouthwash like Scope or Listerine, but Listerine is still the most popular mouthwash sold in the U.S. It kills germs that lead to bad breath, plaque and gum disease and give you 12-hour protection each time you use it. It is a known plaque fighter that will help reduce plaque by 52% in addition to just brushing and flossing. It is also the only nationally branded antimicrobial mouthwash to receive the ADA Seal of Acceptance for fighting plaque and gingivitis. What you need to know: Listerine has four essential oils in its formula; eucalyptol, menthol, methyl salicylate, and thymol that help to kill the biofilm that is left in your mouth after brushing that can lead to gingivitis. Despite concerns about the alcohol in the formula Listerine is the most extensively researched mouthwash with around 50 years of research under its belt. What do reviewers love about Listerine? Consumer’s love this product has the seal of acceptance from the American Dental Association and helps to control plaque and gingivitis, which helps to reduce plaque build-up, gingivitis, and bad breath. It is also inexpensive compared to competitors. Good for People who: Love the clean feeling and don’t mind an intense burning sensation. Avoid it if you: Should not be using alcohol-based products. Usually not recommended for those who have receding gums. Why this is a great product- it has an easy to use dispenser (no mess). It’s not alcohol based, and it gives you fluoride to help prevent cavities. If you are looking for a fluoride rinse, this is the one to get. 75% of dentists recommend that their patients use a fluoride rinse to help prevent cavities and ACT is the brand that they like to recommend. 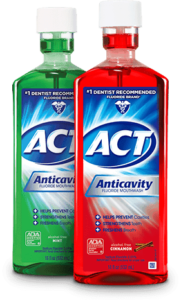 ACT® Anticavity contains the maximum amount of fluoride available in rinse form without a prescription and does have the American Dental Association Seal of Acceptance. What do reviewers love about ACT? Customers love that the flavor is pleasant and not overpowering. Everyone also likes that it comes with a little measuring device, so you don’t accidentally take too much. The other two points that users love is alcohol-free (doesn’t burn) and the fluoride in it helps to prevent cavities. Good for People who: Want a robust fluoride-containing product. 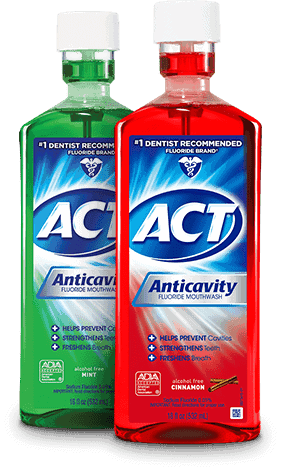 ACT has .05 % fluoride, which is the maximum you can get without a prescription. Avoid if you: Have health concerns about fluoride, or don’t need a cavity prevention rinse. Therabreath takes a different approach; it uses something called OXYD-8 as the active ingredient. OXYD-8 is an oxygen compound that interacts with the odor-causing bacteria to prevent them from creating sulfur compounds that becomes bad breath. It has a mild mint flavor, and reviewers praise its effectiveness in getting rid of bad breath and leaving your mouth feeling fresh and clean. There is no alcohol or artificial flavors or colors in Therabreath, and it is certified vegan, gluten-free, and kosher. Therabreath is a runaway bestseller on Amazon, it has crazy good reviews, and people love it, but before you buy a bottle, be aware that some users end up having some odd side effects from TheraBreath due to the ingredient Chlorhexidine. Some reported side effects are: sore throat, dry mouth, changed the way food tastes, can leave a metallic taste in some users mouths (sometimes for days). What do reviewers love about Therabreath? Reviewers like that it has more natural ingredients than other products on the market. It is clear fluid with minimal flavor, and it leaves you feeling very clean with no burning sensation. Many users who have severe halitosis have found it to be very useful with the effects lasting for a long time. Good for people who: Suffer from dry mouth, tonsil stones, chronic bad breath. Avoid it if you: Are worried about potential side effects like getting a sore throat or a metallic taste in your mouth that won’t go away. 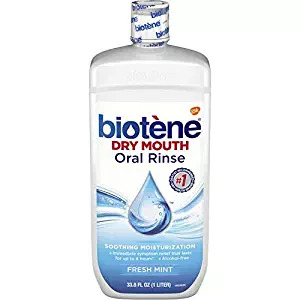 Biotene is made explicitly for users who suffer from dry mouth, and it gently cleans and soothes minor irritation as a bonus. It is alcohol-free, and most users love the mild nonburning taste. What you need to know: The formula changed a few years ago, much to the chagrin of some long-time users. In the new solution, two different parabens have been added; many people don’t like being exposed to parabens because they can be absorbed into the skin or blood. There is some debate as to whether they can be linked to breast cancer and the increasing rate of early puberty in girls. What do reviewers love about Biotene? It works well for most people who are suffering from dry mouth. Biotene is the product most doctors or dentists will recommend. It doesn’t burn as other mouthwashes do and it freshens the mouth well. Good for People who: Have severe dry mouth due to medications, Sjogren’s or chemotherapy treatment. Avoid it if you: Are concerned about parabens. Also, don’t use if you are suffering from only halitosis- there are better options for you. If you are looking for a vegan, cruelty-free and nontoxic wash, you should give Oral Essentials Clean & Fresh Mouthwash a try. Some people find the taste to be a little harsh to get used to, while others love this stuff. It used to contain zinc, but that has been removed. Instead, you are getting essential oils, sea minerals and aloe vera that work together to give you a clean, fresh mouth. 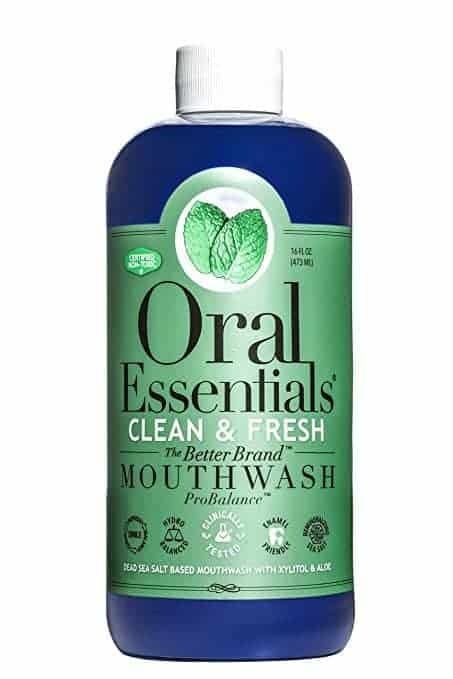 Oxyfresh Lemon Mint Mouthwash is an excellent option if you have trouble with bad breath. It uses zinc acetate and chlorine dioxide to kill off the bacteria that causes odor. The effects of this product also reportedly last all day. Oxyfresh is one brand that seems to get recommended by dentists quite a lot because of the effectiveness of the product, and the ingredients are considered to be safe and nontoxic to use. Some of the elements include essential oils and extracts from lemon and peppermint. The other aspect of this rinse that people love is that it doesn’t contain any dyes so that it won’t stain veneers. There are various benefits to using a mouthwash depending on the product you choose. They are classified as either cosmetic or therapeutic. Cosmetic mouthwashes only mask bad breath and leave a fresh taste in your mouth, while Therapeutic mouthwashes do things like attack bacteria and plaque, and strengthen teeth with fluoride. You may want to consult with your dentist to find the best type of product for your particular needs. Do you Prefer Alcohol or Alcohol-Free? Alcohol is the main ingredient for a lot of the major brands, for many customers this isn’t a big issue, but some users may like to avoid alcohol. Never let children use an alcohol-based mouthwash in case they accidentally swallow it. Users with sensitive or receding gums will probably also want to avoid alcohol. Alcohol in mouthwashes is also a drying agent, so if you have problems with dry mouth, it is best to avoid it. Are you looking for a product to help fight cavities? If you are looking for a formula that will help prevent tooth decay, you will have to get one that contains fluoride. It works by helping to rebuild weakened enamel. If you worry about safety concerns, obviously you would avoid products that contain fluoride. Are you looking for an oral rinse that can help with gingivitis? Gingivitis refers to inflamed and infected gums that are the early stages of gum disease. Oral rinses that contain essential oils help fight gingivitis since they can soothe gums and help to get rid of the bacteria that cause gingivitis. Do you need help with bad breath only? If your main concern is bad breath you can look for a mouthwash that contains eucalyptol, thymol or menthol, that can help to improve bad breath. Is dry mouth a problem for you? There are a few products that have been designed to help alleviate dry mouth (Biotene, ACT Dry Mouth). If you are having dry mouth and are currently using an alcohol-based oral rinse, you may want to stop as alcohol is a drying agent and will make the problem worse, try to switch to an alcohol-free rinse. If you are worried about ingredients in the major brands, some products are chemical-free, sugar-free and alcohol-free. They might use baking soda as a natural abrasive ingredient that will remove stains, or they may use something like ginger or pure mint oils. You can even make your own rinse using essential oils and baking soda. Essential Oils As mentioned above, certain essential oils make great ingredients in natural mouthwashes. They are so effective that they are being used in some of the big commercial products including Listerine Antiseptic. They may have a strong taste that some users won’t like, but they are very successful in reducing bad breath. Alcohol– In some commercial brands, the amount of alcohol can go as high as 27% vol. Also, alcohol is a drying agent, which encourages bacterial activity in the mouth, releasing more malodorous volatile sulfur compounds which, oddly enough, ends up making your breath worse. Fluoride– Fluoride is the ingredient you will want to look for if you are worried about tooth decay. Look for ‘anti-cavity’ formulas. Chlorhexidine – This is the main ingredient the popular alternative mouth Therabreath. Chlorhexidine is very effective in fighting halitosis, although be aware that it can temporarily alter your sense of taste, and isn’t recommended for long-term use. Hydrogen Peroxide– If you are looking at whitening formulas, hydrogen peroxide will most likely be one of the main ingredients. There is some debate according to dental professionals whether whitening rinses will have much effect, especially if you have severe stains. If you’re unsure about any of the products that you may be considering, look for an indication that the American Dental Association has approved the product.